The WD My Cloud Home is a solid, robust, reliable and easy-to-use backup and storage solution for your home and comes with a ‘Recommended’ verdict from the SharpShutter.co crew. As tech nerds, we’re pretty used to the term “Cloud” in 2018. There’s been an increasing trend in “cloud” based storage solutions over the last few years, and companies are striving hard to release products that embrace the cloud — at least in marketing if not in the core. Yet, the “cloud” still remains a mystery for most people today. It is known to be a broadly vague term in today’s market and in any given home, a majority of users are still unaware of what it really means. In this scenario, there is one company that is pushing the envelope and making the “cloud” more natural and accessible to all users. If you’ve been following our reviews over the last two years, you’re likely aware that we’ve sung high praises for WD. 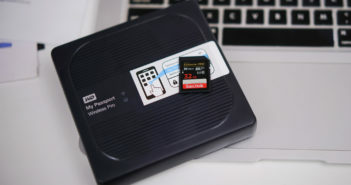 Not only is WD the best-known storage solutions provider in the market today, but it is also making a name for itself as one of the few companies that are making backup essentials simpler & more comfortable to use. WD has been churning out incredible products over the last six years and the WD My Cloud Home is its latest offering that simplifies storage and backup solutions for the masses. I have used many different WD devices over the last 8+ years, and no other device has offered an experience as remarkable as the WD My Cloud Home. 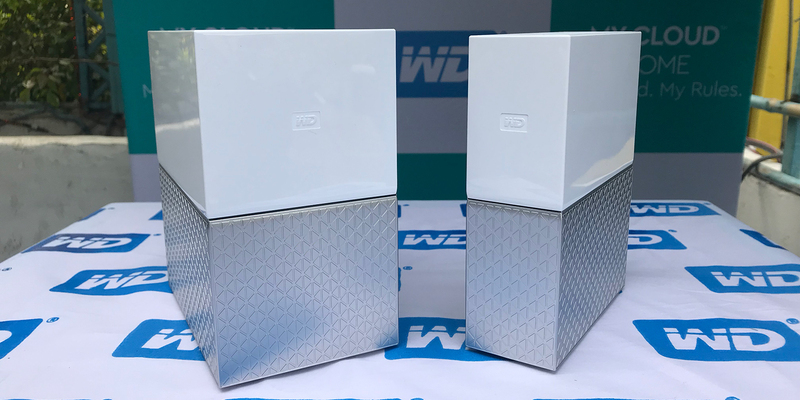 While many of WD’s products in the past have focused on providing seamless storage solutions to its users, the WD My Cloud Home is a substantial step that offers not just a robust backup and storage solution, but also an incredible & intuitive software interface to set up & interact with the product. Today, smartphones have become an integral part of our lives, and cameras have also become more affordable and accessible. As a result, the number of photos and videos that we take in a week has gone up substantially in the last few years. Today, we take all kinds of photos of all kinds of things, and then we need to store these photos safely somewhere we can access later. Sure, services like Apple’s iCloud Photo Library and Google’s Photos have made backing up and storing your photo collection super easy, you still need something closer to home when you want more control and accessibility towards this data. Here’s where WD’s My Cloud Home comes into play. 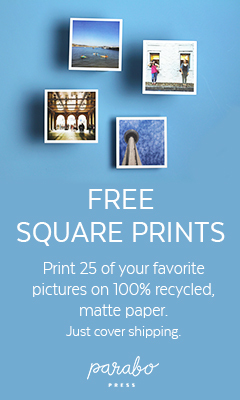 It works as a fantastic solution to offload your photos, videos and other data in your own home and have it accessible any time and any place. The WD works like a Network Attached Storage solution but comes without all the hassles and complications related to a traditional NAS solution. It’s easy to recommend the WD My Cloud Home to anyone looking for some peace of mind. Unfortunately, there’s a major flaw in the way that the My Cloud Home works and because of that, it fails to get the ‘Highly Recommended’ verdict from us like the previous review of the WD My Passport Wireless Pro. Instead, we settle on a simple ‘Recommended’ verdict instead. Read on to find out what’s good and what’s not about the WD My Cloud Home. 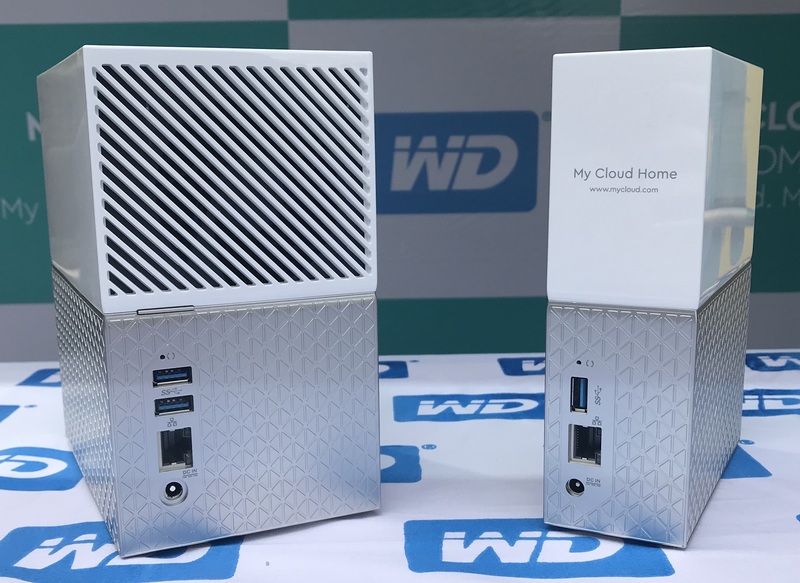 As the names suggest, the WD My Cloud Home is a single-drive version, while the My Cloud Home Duo is a dual-drive version that’s configured in RAID 1 (Mirror Mode). This means that your data is automatically mirrored on both drives, simultaneously, so in case one drive fails, you can still recover your data in most cases. Obviously, if you’re storing important or critical data on the My Cloud Home, you’d best choose the WD My Cloud Duo version. My Cloud Home → 2TB, 3TB, 4TB, 6TB and 8TB. My Cloud Home Duo → 4TB, 6TB, 8TB, 12TB, 16TB and 20TB. If you’re looking for a safe place to back up your photos at home, you won’t go wrong with the WD My Cloud Home Duo having your back. 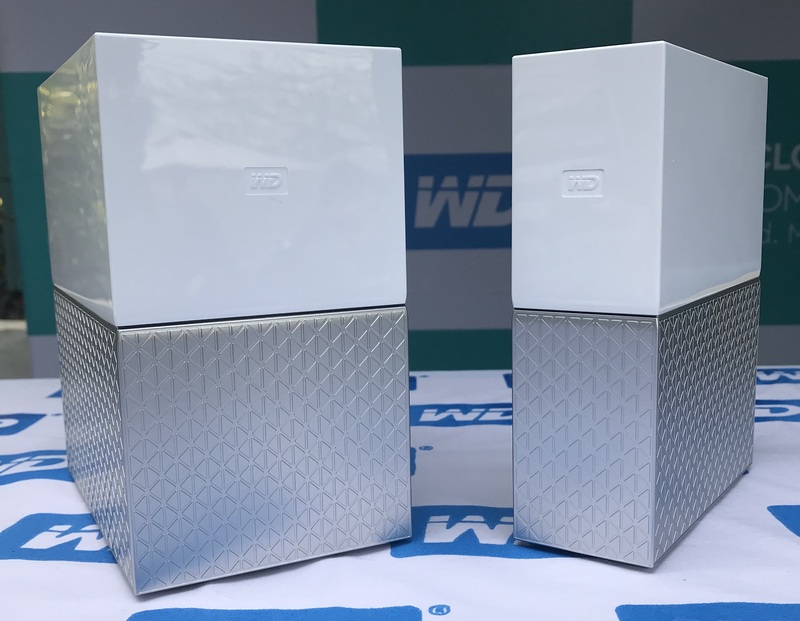 The WD My Cloud Home is by far the most attractive product that Western Digital has released so far. The design is sleek, crisp, geometric, and impressive. The drive ships in a gorgeous white and grey housing, complemented with a subtle, minimal white LED on the front. The two-tone look with the patterned grey exterior looks incredibly sharp, and the product makes for an excellent table-top showpiece, quite unlike the dark, glossy black products with shiny bright LEDs from WD’s past. The LED strip on the front does a great job of telling you what the drive is up to. The single-drive equipped My Cloud Home has 1 USB 3.0 port at the back, along with a Gigabit Ethernet port, a reset switch, and DC IN power supply inlet. On the other hand, the double-drive equipped My Cloud Home Duo has two USB 3.0 ports at the back, a Gigabit Ethernet port, reset button and DC IN power inlet. The USB ports on either variant allow you to import data from USB devices on the fly, making us wonder why WD did not choose to place them at the front of the device for easy access. 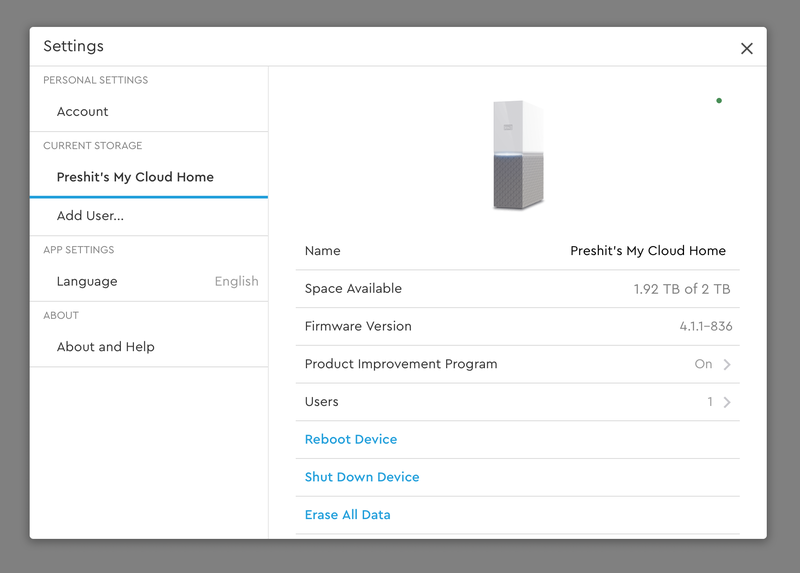 A positive thing about the My Cloud Home Duo is that the drives are user serviceable. That means that in case your drive fails, you can just replace the failed drive with the new one yourself. This might seem trivial, but saves you a lot of hassles. The features of the WD My Cloud Home are what set it apart from the rest of the products available in the market. This device is being marketed as a “cloud” for your home — meaning you can back up and store your data on to this device, and then be able to access that data from anywhere. You control, access, and manage the drive either by using WD’s website at https://home.mycloud.com/ or by using the My Cloud Home apps for iOS and Android. The drive stays connected to the internet, and this WD has made available some pretty nifty services within the My Cloud Home portal, such as Plex, IFTTT, Social & Cloud Import, Sonos, etc. You can enable and configure these services, and the My Cloud Home drive will work in tandem with these services. Plex: Once enabled, you can run a Plex Home Server off your WD My Cloud Home drive, so all the media stored on your drive can be viewed using any of the Plex client apps. Social & Cloud Import: This allows you to connect your social network accounts such as Facebook and Instagram and the service will automatically download and import your photos and other media for safekeeping on the drive. Similarly, you can configure Sonos playback, use IFTTT to take the device to the next level, and set up an Amazon Alexa skill to play songs stored on the device. Unfortunately, in our testing, the Plex service worked very poorly and wasn’t worth the effort. I’ve seen many people consider the My Cloud Home as a Network Attached Storage (NAS) device, but it’s quite unlike a NAS we all know. One of the major differences between a traditional NAS and the WD My Cloud Home is that the latter is inaccessible completely if you are not connected to the internet. There is absolutely no way you can access the data stored on this device on your local LAN or Wi-Fi connection. You can open an SMB connection to the drive, nor can you type an IP address in the browser to open a control panel. Using the internet is the only way to access the drive, so if your ISP fails, you can’t access the drive at all. This also means that you cannot use the drive for backing up outside of WD’s apps, with an exception. WD does support Time Machine backups on a Mac, but if you’d like to use SuperDuper or Carbon Copy Cloner to back up your Mac to an external device, the WD My Cloud Home is of zero value to you. This is another area where the WD My Cloud Home sorely disappoints. Copying of files from a PC or Mac on the same network is always painfully slow, nowhere near the traditional network transfer speeds you’d see on a NAS drive. Now, I should clarify here that this isn’t because the drives inside the My Cloud Home are slow or that WD is purposely throttling the speeds. Due to how the device is configured to work, its performance is very dependent on the files being copied over WD’s own network implementation, and thus, sub-par. On the other hand, if WD’s goal was to focus on the ease of use and accessibility over performance, then they’ve met that goal with the device. I think the WD My Cloud Home is a fantastic product from the house of Western Digital and while it does have a few flaws here and there, including the major one that makes it useless if your internet connection dies, it still makes for a fantastic storage and backup device for most people. With internet packages becoming super cheap thanks to Jio’s entry into the market, most homes today have unlimited broadband internet connections accessible to them and considering how amazingly well the My Cloud Home works on backing up your data and making it accessible from anywhere in the world, it makes for an easy recommendation. The WD My Cloud Home is a very solid backup and storage solution for your home needs. It takes care of the most common use cases found today and works incredibly well for the purpose. In spite of a few flaws, it still makes for an easy recommendation.